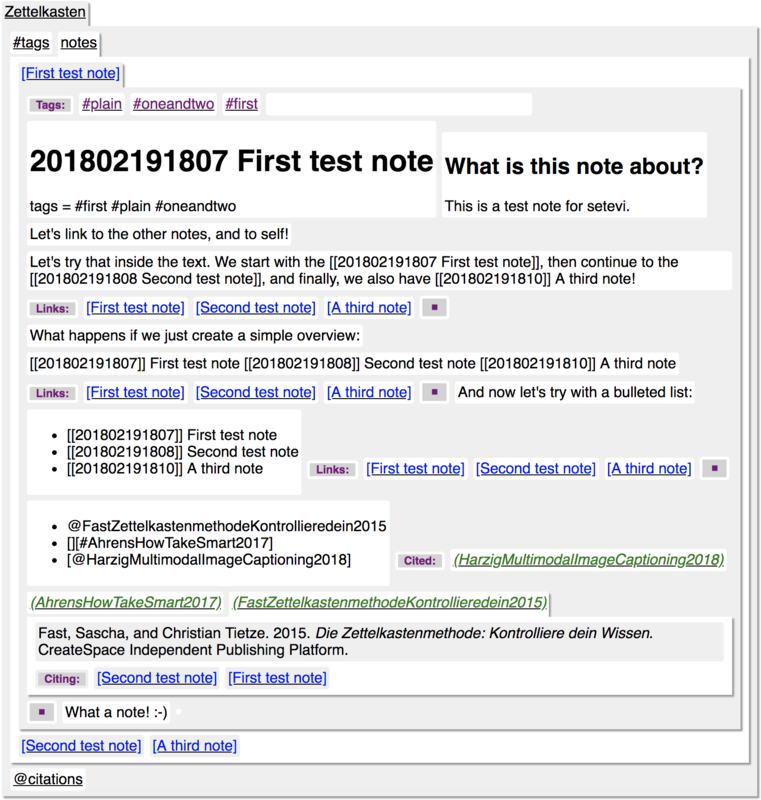 This discussion was created from comments split from: Setevi: expandable note link trees. Well, it is a start, but lots of formatting work still needs to be done. is replaced by its title. I have to split text from 'links' to create clickable nodes. That destroys bulleted lists. which can be found on github in the scratch/zksetevi folder; the resulting HTML file is in the output/ directory. It's much better now that I place links after the paragraph containing them and added a bit of color. Had time for a little update: citations! 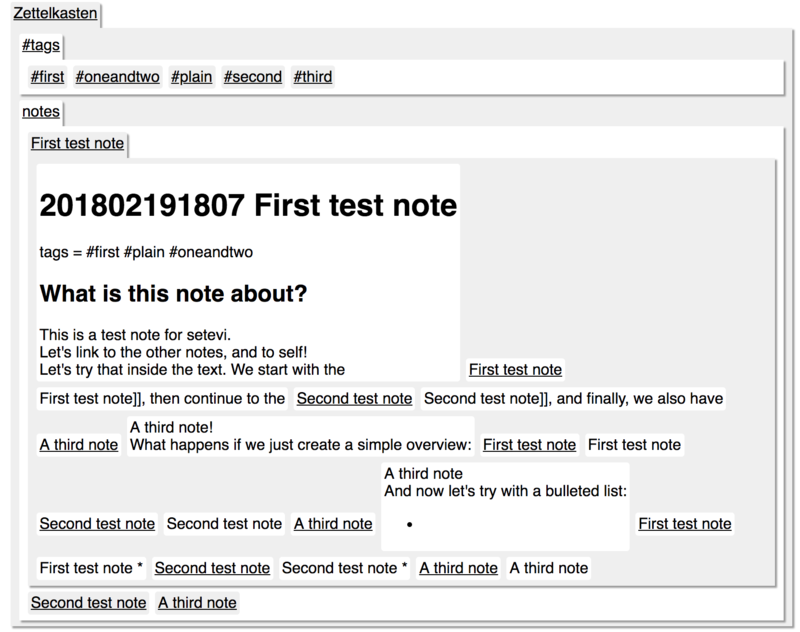 Next up is a tab next to notes and tags, so you can find notes that cite a given source. At the moment, running the conversion script repeatedly changes some connection IDs, but I didn't investigate why this behaves unpredictable at the moment. 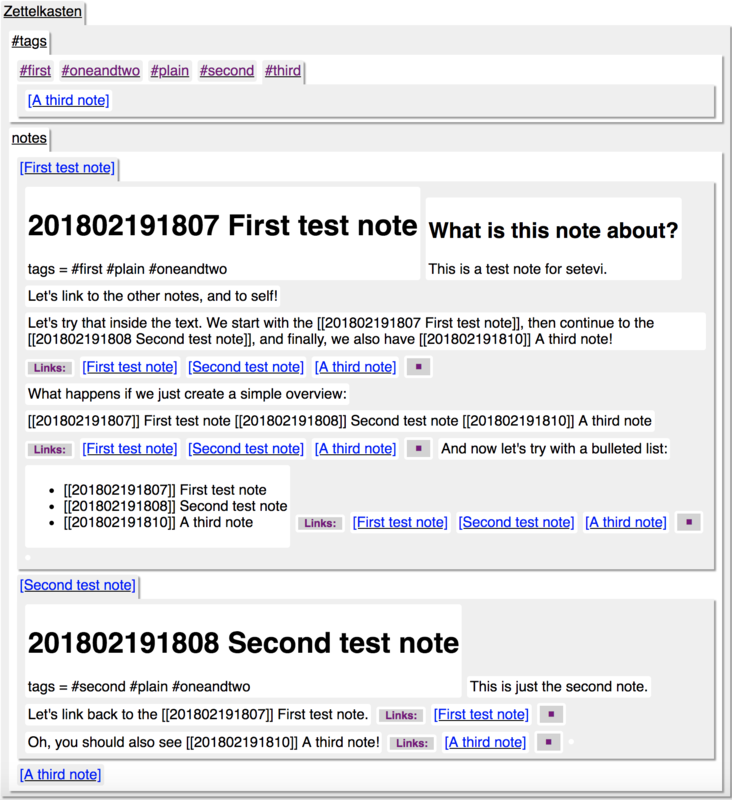 Maybe a factor of unpredictability is: When you link to a note id and you have multiple files whose filenames start with that exact note id, then only the first one found will be picked. But I'll dig into this once I can reproduce. The code is probably a bit confusing if you're new to the setevi node structure and how I "did" things, but if you find sth, I'll look at it. 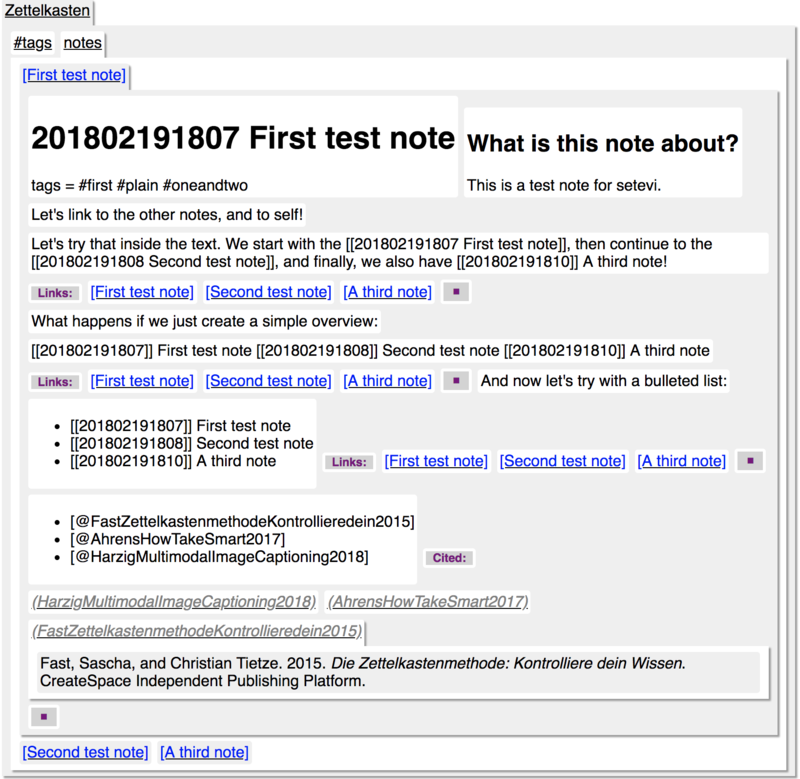 Maybe a factor of unpredictability is: When you link to a note id and you have multiple files whose filenames start with that exact note id, then only the first one found will be picked. I have to correct myself. This is a python feature: Not all my lists (sets, dicts) are ordered, so the order in which I process nodes is not guaranteed (especially when I iterate over dictionary keys). Hence node_ids can vary from run to run which is reflected in the connections. I didn't dig into this deeply. 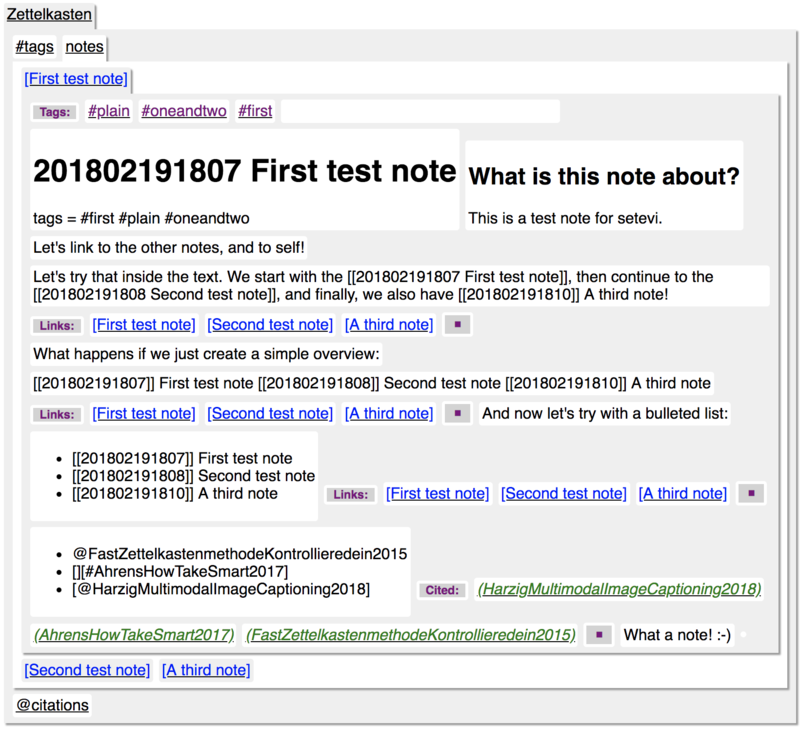 If you think the generated HTML links to notes it shouldn't, then please tell me I am wrong . I hope you don't mind the spamming. 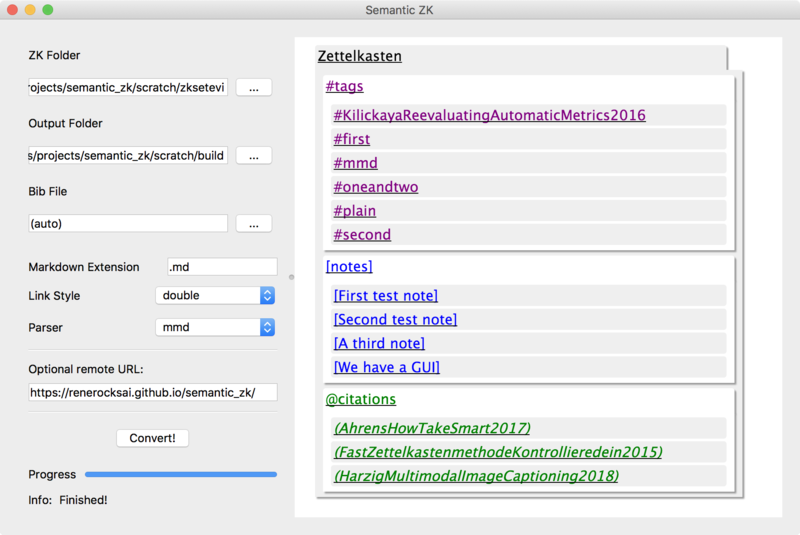 When converting my real ZK, I was astonished how cool browsing it with Setevi is (by tag, citekey, related notes...) . The notes look quite OK, and with all the links in place I could really follow my web of thoughts and get carried away. Awesome! I incorporated pandoc parser support. This gives us tables and fenced code blocks for free. Once I make more progress, I'll generate OS specific executables so nobody has to mess around with python and packages. I want to incorporate more parsers, maybe I'll find a decent multimarkdown capable one. Also note, that the pandoc parser is rather slow. So don't process hundreds of notes with it if you don't want to wait for a couple of minutes, staring at the progress messages. I guess, soon it will be time to create executables so everyone can try it out. I am also in a discussion with @fbb to switch to a pure vertical layout in Setevi. The Multimarkdown parser is way faster than spawning a pandoc process. 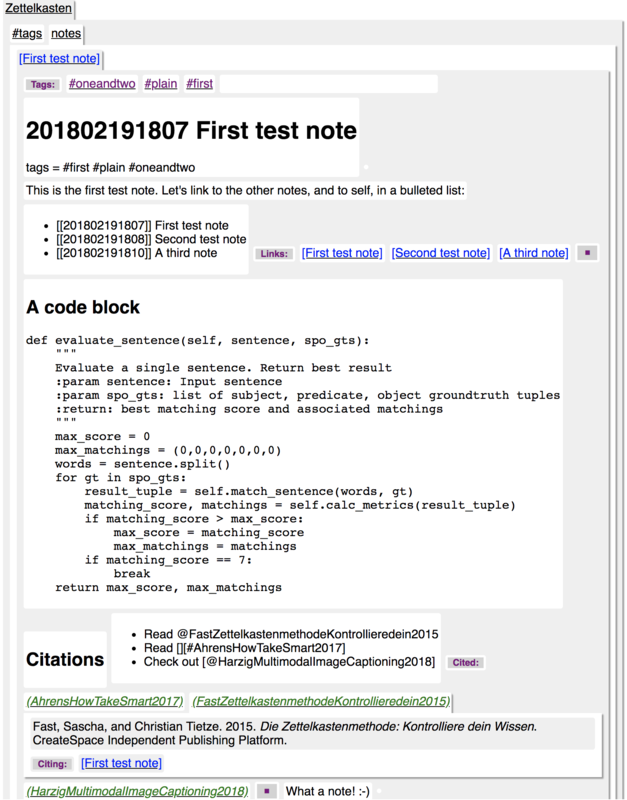 The script converts pandoc citations (@citekey) and pandoc fenced code blocks (~~~code~~~) to multimarkdown automatically so pandoc can be avoided. So the only reason I can think of that requires to select the pandoc parser is if you're using pandoc style tables. I have just published a pre-release! 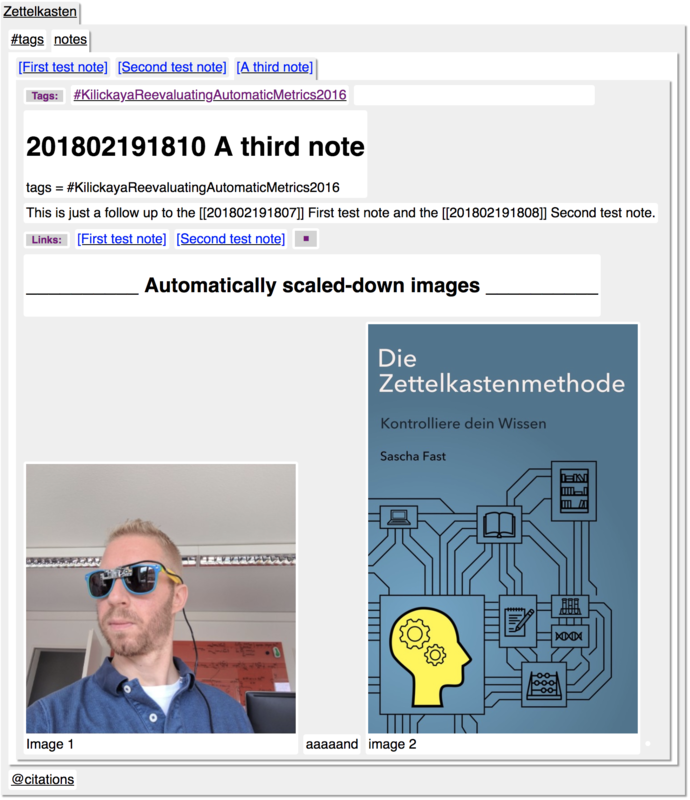 Now even non-python-freaks can convert their Zettelkästen into the current Setevi format, too! 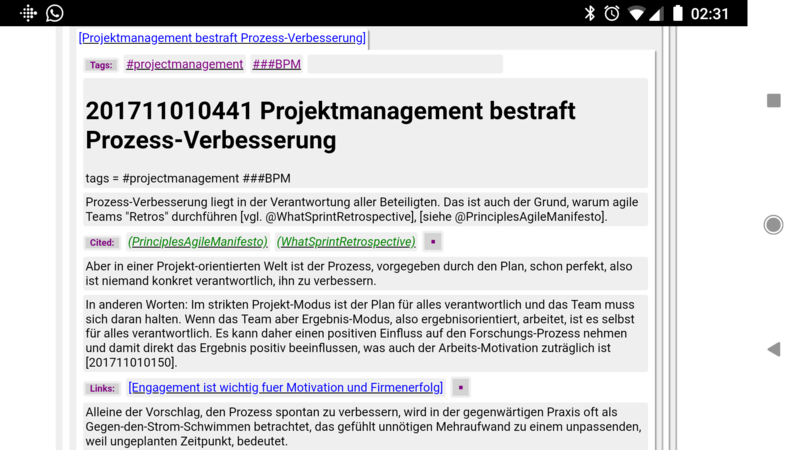 (BTW: Maybe @fbb will update it soon, for a more natural reading experience with a strict vertical layout). It contains standalone executables for both the macOS and Windows 10 versions of the command line tool. I hope they work on other computers, too. If anyone's brave enough to try them out, I'd be happy to take feedback whether there are some unresolved dependencies or other problems. A GUI version will be in the works, soon. You'll need pandoc installed (creates citation sources). You should always use the default mmd parser, even if your text uses pandoc syntax. 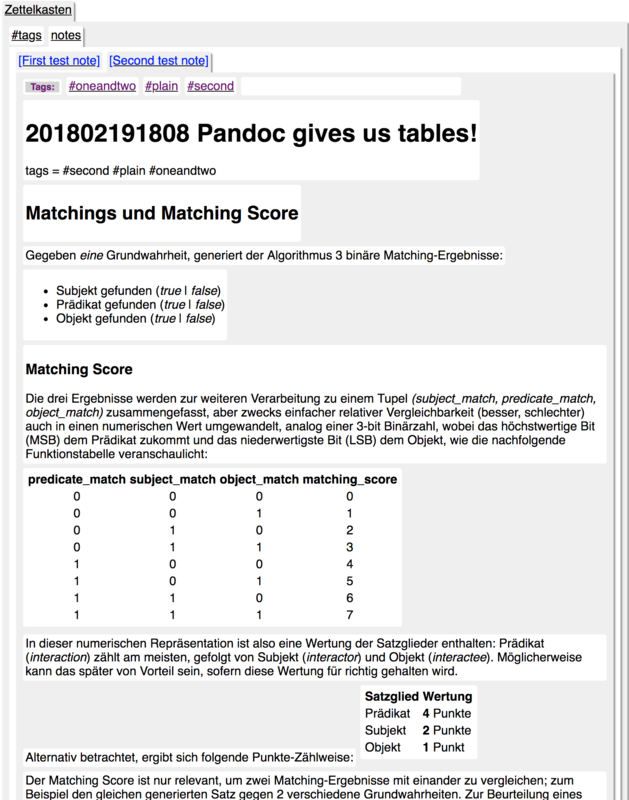 The only exception is: If your text contains pandoc style tables, then go for the pandoc parser. 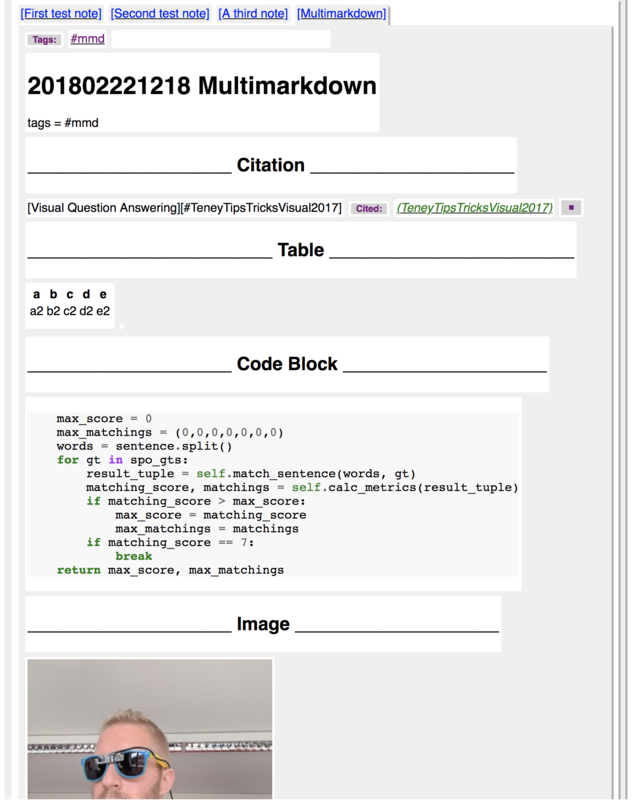 Pandoc [@citations] and pandoc ~~~fenced cod blocks~~~ will be converted internally automatically by the tool, so that the multimarkdown parser can handle them. ... and surrounding <img> tags in links to open in a new window? I've just pushed the change! 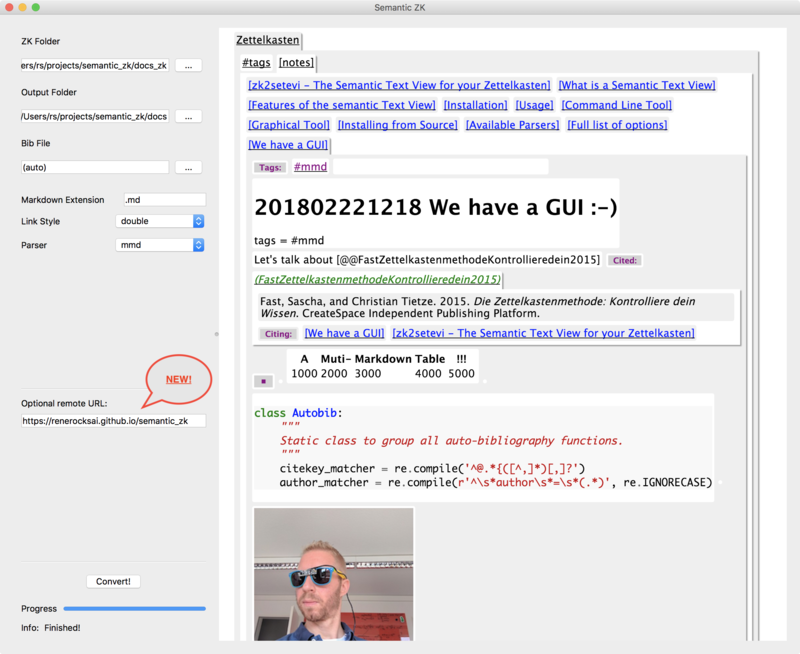 We now have a GUI !!! 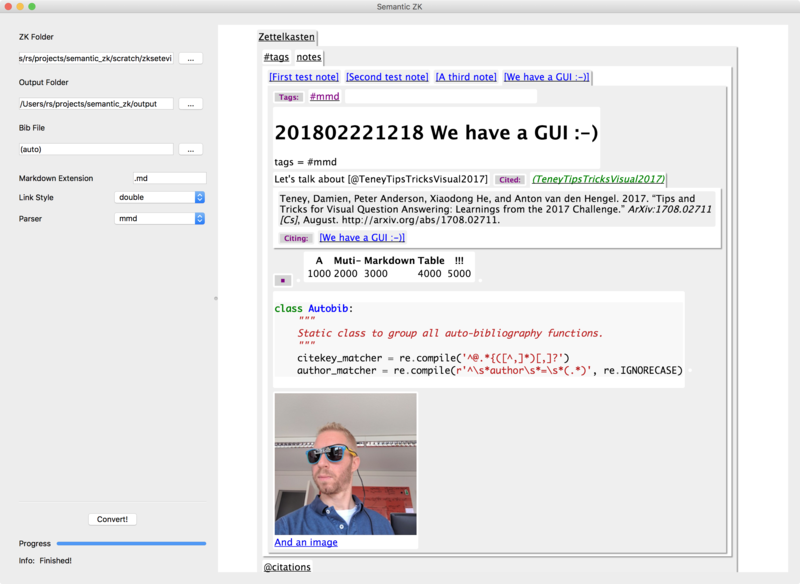 The binaries for both command line and GUI version are released! MacOS can really be a pain sometimes. I had to update the binaries of the release for macOS. I didn't want to create a full-blown release for that. Now the graphical tool is a "real .app" and doesn't open a terminal anymore. Also some PATH issues have been fixed, in order to find pandoc. In addition, should anything go wrong, a stack trace is reported for debugging. BOOOM See it in action! 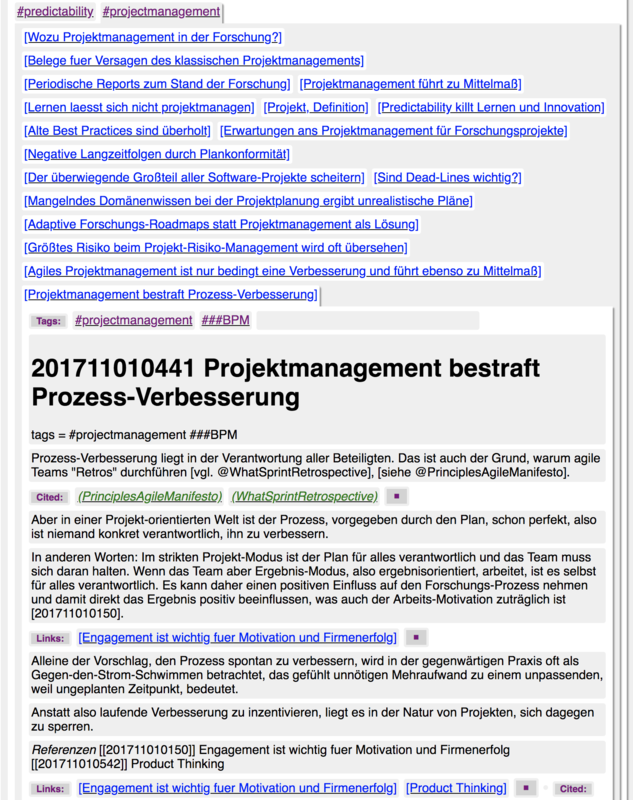 Semantic_ZK is now documented in Zettelkasten style and has converted its own documentation . I've just uploaded a new release. 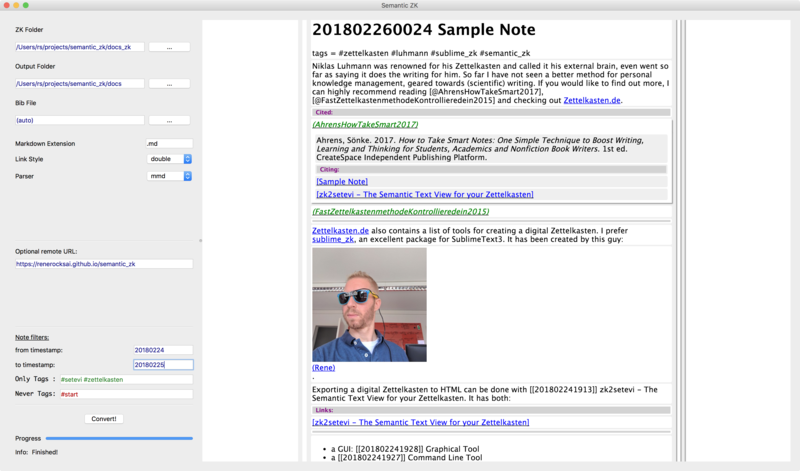 You can see the converted semantic_zk documentation in action here! The layout in the generated HTML is now all vertical! Thx @fbb for the setevi update! . This makes for far better readable notes. Check out the README for more information. Oh boy, this escalated quickly! Great work, @rene and @fbb! We now have support to export only part of a Zettelkasten!